If you are looking for more than just a keynote speaker but rather someone who has “been there done that” in the trenches themselves then look no further. Elaine Allison, CSP is an international speaker and Customer Service Expert who has truly learned the secrets of customer service first hand. 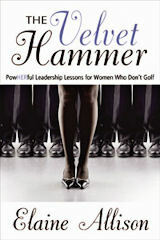 She is author of the best-selling book, The Velvet Hammer: PowHERful Leadership Lessons for Women Who Don’t Golf. 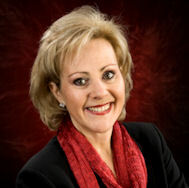 Elaine delivers powerful keynotes and training programs that have immediate impact audiences. Your audience will learn new skills and techniques that they can apply immediately. Elaine was one of Canada’s first female prison guards in an all male maximum security prison at the age of 19. She had a crash course in understanding how people interact with each other as her life virtually depended on it. She began to truly observe how we resolve issues, discover innovations and uncovered unique methods for dealing with even the most difficult situations. She has been featured on ABC World News, Global TV, The Globe and Mail and many networks, newspapers, and radio shows across North America. Elaine’s hands-on experience, real life stories and illustrations of what we encounter daily helps audiences consider all their options and apply immediate solutions. Without customers, there is no business. You won’t need a marketing, accounting or operations department without them. Organizations that have raving fans actually have fewer error rates and lower costs to handling service breakdowns. The question is: How do you get your departments, stakeholders and (in some cases) even your suppliers to provide the kind of service you expect? If you want to become #1 in Customer Service, or stay there in your industry, then you’ll want to find out how we can help you develop a customized Customer Service Training program distinctly for you. Elaine will uncover your most challenging customer service issues, conduct a thorough training needs analysis to discover the top skills that will make the most dramatic improvement. 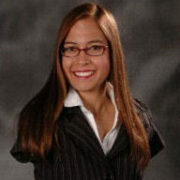 She will then develop and deliver a program distinctly for you that gets results. She’ll even help you theme it for your brand or product launch. And if you are interested, she can look at ways to bring it in-house and train your trainers and leave them with all the materials and leaders’ guides so you have a legacy program for years to come. Training is not a cost, it is an investment. Customer Service has to be supported by leadership. In her Managing Customer Service course that will be customized for you, Elaine will look at current skill gaps as told to her by your leadership team during our needs analysis. Leaders themselves often know what the challenges are, and when given the right skills to support them, a company and their teams win. This course is often recommended with our front-line Customer Service course. With Elaine’s customized Change Management Training she will help ensure leaders and teams are ready to manage the challenges that the change creates. This program is uniquely tailored by thoroughly investigating the impact of the changes and developing modules with the right skills to ensure everyone is well equipped to manage the process. Whether a seasoned professional or a new leader being developed for leadership, Elaine will tailor a Supervisory Training course specifically to ensure your managers, supervisors or team leaders are equipped to handle the most difficult leadership challenges. How to handle everything from difficult employees, managing multiple projects and priorities, to motivating teams and much more can be included. If performance and contributions of employees have been slowing down or lagging, this Performance Management Training customized for you may just be what your mangers need. Modules can include how to conduct an effective performance review, how to discover which of the four reasons an employee is performing below expectations and what to do about it. Managers will learn a unique technique to reprimand or correct without alienating the employee. Would you like to get more of what you want? Did you know you can only get what you want if you can give the other person what they want? In this highly interactive Negotiation Skills Training, audience members will learn the secrets of negotiation. Areas such as getting prepared, doing your homework, uncovering needs, problems and challenges and options, as well as closing the deal are explored. The sessions are highly interactive and participants are encouraged to bring their own negotiation challenges. Conflict happens every day. When management and staff are not equipped to handle the variety of conflicts that arise from individual, team, or departmental conflict, productivity is greatly impacted. Perhaps employees need skills to handle a variety of potentially difficult customers, whether in a crowd or a public place. Elaine’s Conflict Resolution Training courses have been taught to diverse audiences, from enforcement groups to front line customer service representatives and leaders with amazing results. Attendees rave about how easy and simple the skills are to implement and no longer feel anxious or nervous to tackle their next conflict. By the way, as one of Canada’s first female prison guards at the age of 19 in an all-male maximum security prison back in the 70’s, Elaine learned firsthand how to handle conflict – her life depended on it. Elaine Allison, CSP began honing her insights into the differences between how we work, lead and succeed early in her career. At just 19 years of age, she was one of Canada’s first female prison guards in an all–male maximum security prison. Elaine’s life depended on quickly understanding how we interact with each other and survive! She began to truly observe how we each deal with conflict, leadership and power as we strive to make a difference in our work and personal lives. Elaine has also: taught children with behavioral problems in a special education program; managed over 1400 unionized flight attendants; and successfully handled the day-to-day challenges of various large corporations as a manager and then as a senior executive. She has learned firsthand how damaging some behaviors and choices can be. She became one of only 13 female speakers in Canada and 10% of speakers worldwide, holding this prestigious designation of Certified Speaking Professional (CSP), recognized globally in the speaking industry. Over the years, Elaine has developed training and keynotes for such industries as travel, trades, finance, insurance, military, corrections, police, retail, food services, media, technology, healthcare. Her messages are universal and are tailored to your needs. Elaine’s hands on experience, real life stories and illustrations of what we encounter daily, all combine to help audiences consider all their options and apply immediate solutions. Several of Elaine’s articles have been printed in industry publications, and others have written about her work in the Globe & Mail, Houston Chronicle, Milwaukee Journal, New York Albany Times, plus every city paper across Canada. She is a popular talk show guest and has been interviewed on over 100 radio shows and seen on ABC World News in New York (twice), Global TV and many talk shows on Canadian cable TV.